Note: At Gusto, our diversity and belonging efforts focus on composition (i.e. ratios) and belonging (i.e. creating a culture of inclusivity for everyone). We believe both are important. This particular post focuses on providing an update on our composition numbers. 30% of the engineers who joined us in 2017 and 2018 are women. 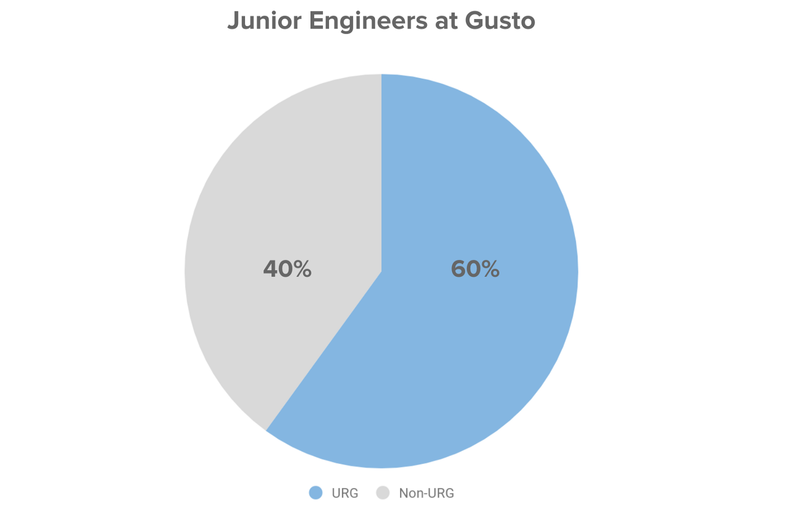 0 female engineers have left Gusto since 2016. 27% of engineers recently promoted are women (proportional to our gender composition today). Along the way, we’ve had a lot of learnings about how to make diversity initiatives successful. I’m sharing them here in the hope that other teams can learn from us and create their own diversity engines. I’ve heard too many engineering managers blame their team’s lack of diversity on a poor pipeline of female candidates. We’ve found that with a bias towards action over a long enough period of time (years, not months), creating a more diverse team is entirely within our control. Focusing on actionable activities like outbound sourcing exclusively for female candidates and sponsoring the Grace Hopper Celebration was instrumental in helping us achieve our goals. Much has been written about diversity debt. 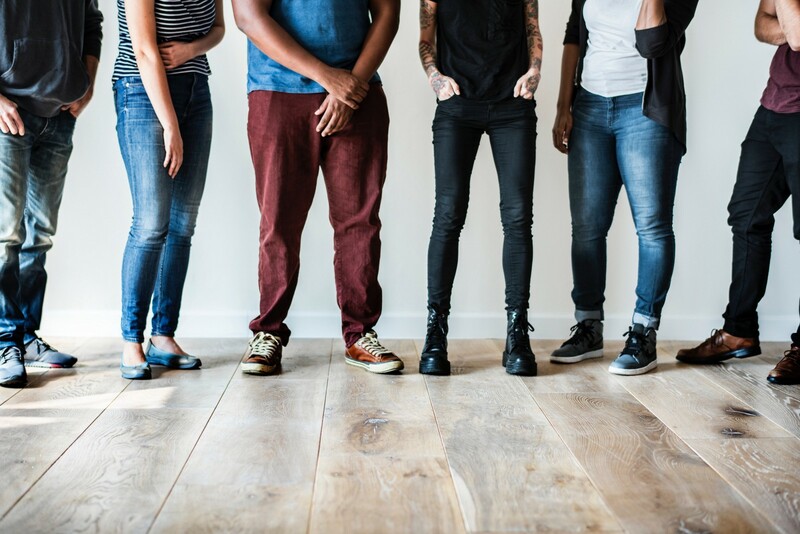 We’ve found the corollary to be true as well: A diverse team tends to make it easier to hire even more diverse candidates. Once our engineering team was comprised of 20% women, we stopped sourcing exclusively female candidates in San Francisco. Despite that, our team continued to get more diverse. Women started referring more women into the company and we found it easier to find amazing team members from underrepresented groups. We also began to get press coverage for our diversity efforts, which again led to a more diverse candidate pool. What started as a recruiting problem had turned into a recruiting advantage over other tech companies. Back in 2015, it was daunting to share our diversity numbers and goals so publicly. But that public commitment also kept us accountable, ensuring that we did everything in our power to hit our goals. More importantly, it signaled to prospective engineers that we took diversity and belonging very seriously at Gusto. We’ve come a long way and have learned quite a bit about building diverse and inclusive engineering teams. At the same time, we know there is much more to achieve and learn. Gender is one dimension of diversity, but there are many others. We’re broadening our diversity efforts to include underrepresented races (such as Black and LatinX engineers) and persons with disabilities. We’re also seeing a lack of diversity when we cut our data by seniority. 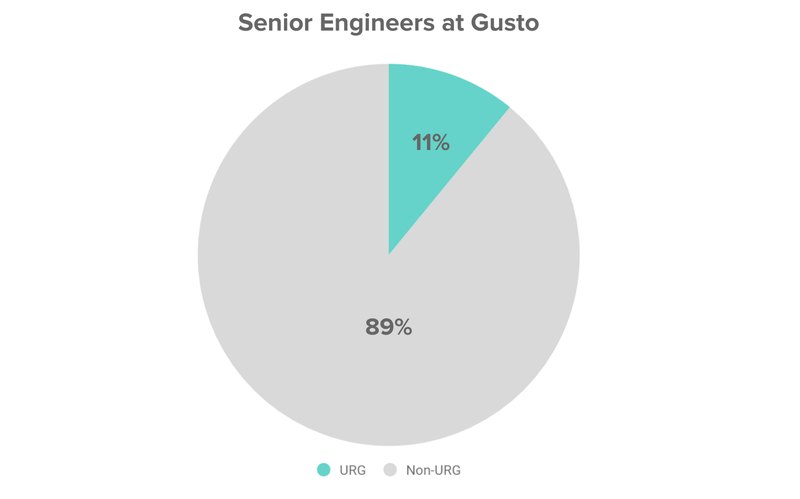 Only 11% of our senior engineers belong to an underrepresented group (URG). For clarity, we’re using the definition of URG that is proposed by the NSF. Over the next six months, we are publicly committing to have 15% of our senior engineers belong to an an underrepresented group. We’re going to be hosting three more round-table dinners to discuss diversity issues in a safe space. We’ve found that this is a great way to meet other senior engineers and share knowledge on diversity issues. We’ve hired two dedicated recruiters who will be focusing 100% of their time sourcing candidates from underrepresented groups. We’re going to be hosting and speaking at conference and events on diversity focused topics. For example, we spoke at the LadyCoders conference already this year. We’re going to do an internal audit to make sure engineers from underrepresented groups continue getting equal opportunity for internal mobility, engagement, and retention. We believe that great ideas can come from anywhere, so if you have suggestions on how we might achieve our goals, please let us know in the comments below. Like before, we’ll publish an update on March 1, 2019 to share the results and lessons of our efforts. We hope you’ll help keep us accountable! Originally published at engineering.gusto.com on September 17, 2018.